Welcome to the first ever guest post on Fossil History! Today, Roberto Sáez takes you through a site that has yielded many discoveries that tell scientists about human evolution! I am glad to write about Atapuerca on Paige Fossil History. Atapuerca is an amazing site for the study of Human Evolution. It is actually composed of a set of 7 major sites located along the southwest side of the old mountains called Sierra de Atapuerca. There are other smaller sites in the area with ancient human presence, both caves and open air places. Atapuerca is located at the North of Spain, very close to Burgos which is the 2nd largest city of the vast Nothern Castilla region. It is 200 km north of Madrid and 170 km south of the nearest coast line in Cantabria (which is a Spanish region famous for the great number of Upper Paleolithic caves with prehistoric art). 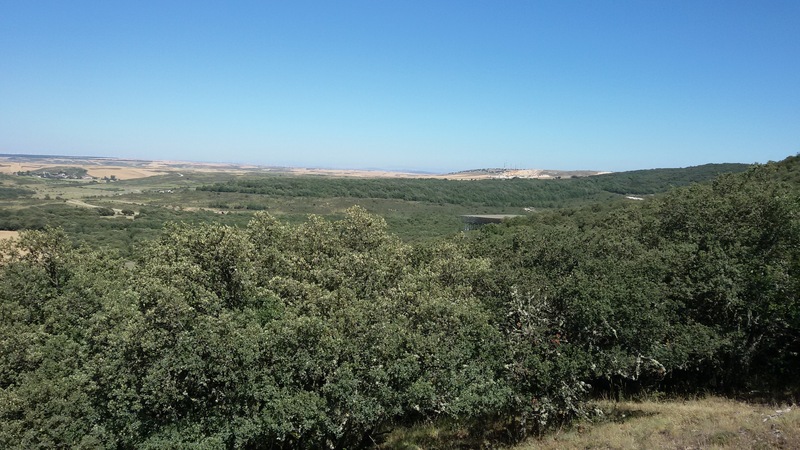 By the end of the 19th century, the activity of the steel mining in Nothern Spain had a sudden activation and so the need for coal and iron ore. A mountain chain near to Atapuerca, called Sierra de la Demanda, was identified to extract additional resources. 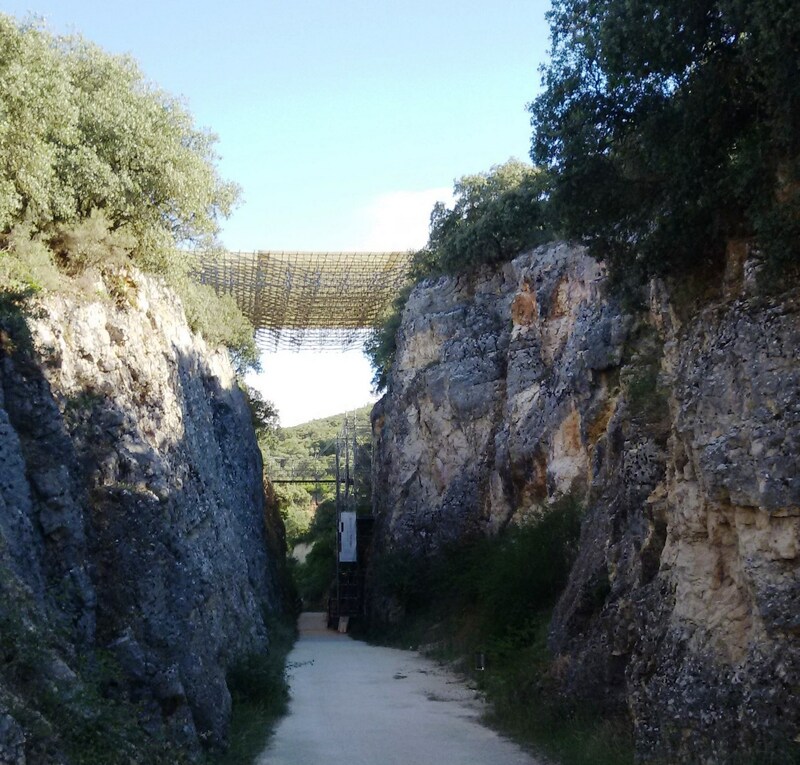 A railroad was built crossing the mountain of Atapuerca, in order to transport the mineral to the blast furnaces located 65 km north of the mountain. However this business was not profitable and closed after less than 10 years. The railroad construction left a trench in the mountain, the Trinchera del Ferrocarril (‘railroad trench’). It is about 1 km long and 15-20 m high, and uncovered a number of ancient caves which were collapsed and filled by fossil-bearing sediments. In parallel, there is a karstic complex in the area called Cueva Mayor ‘great cave’, which was well known since the 1860s. Between then and the 1950s these caves were explored and some ancient human remains started to arise in the 1960s. In the 1970s a group of scientists started to systematically excavate and study all this Atapuerca complex of sites. 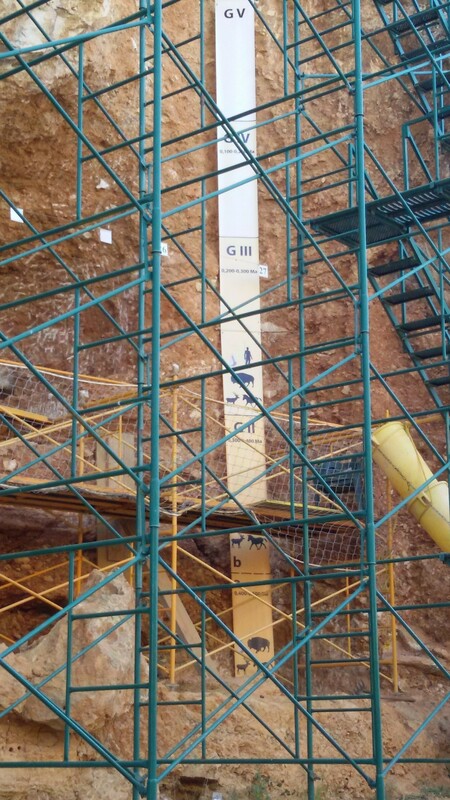 The 1980s and 90s were the golden age for Atapuerca, when a huge number of hominid fossils and related technology appeared, showing a continuous timeline of human presence since 1.2-1.4 million years ago, up until the middle Ages. Sima del Elefante (‘Pit of the Elephant’): a site with 10 meters of sediments. The upper levels are dated to 200-230 Ka. and contain faunal remains associated to Acheleuan lithic. The lower levels are the oldest known locality in Atapuerca.”In 2007 a fragmentary mandible with some teeth was recovered, dated to c. 1.2 Ma., which is the second oldest evidence of human presence in Western Europe up to date, only after a 1.4 Ma. child tooth from Orce, Spain published in 2013. Gran Dolina (‘Great Sinkhole’), and reflects exactly what this place is about. It contains a comprehensive faunal assemblage representative of the Lower Pleistocene. In 1994 several human fragments from at least 6 individuals were found, containing tool marks and together with stone tools, which suggests cannibalism. They were dated to 780 Ka. and defined a new species Homo antecessor. Galería: it was a natural trap where many animals fell down between 200-300 KYA and their bones were defleshed by humans, who used the site not permanently but rather from time to time to enter and scavenge. Sima de los Huesos (‘Pit of the bones’) is the place with the largest number of hominid fossils found. 80% of the total fossil record of the Middle Pleistocene was extracted from Sima de los Huesos! 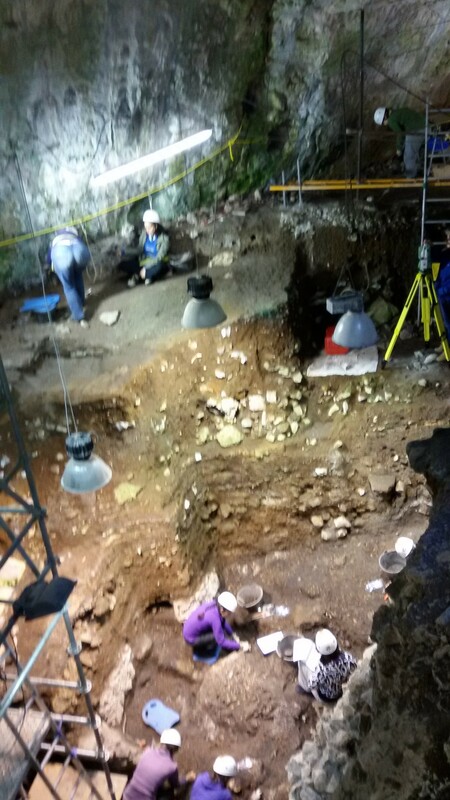 In total 28 individuals have been recovered there so far, with several almost complete skeletons. They are dated to 430 Ka. Initially classified as Homo heidelbergensis, but now they are considered as incipient Neandertals. Fortunately the nuclear DNA is partially preserved, so its analysis will soon give some light about their phylogenetic relations. 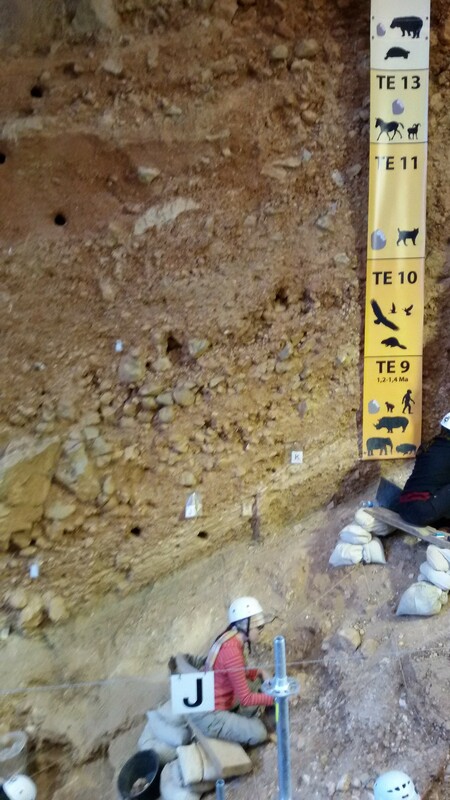 Galería de las estatuas: a cave with Neandertal presence under study (fauna remains, tools). Galería del sílex: a cave with Neolithic presence with exceptionally preserved objects, a structure for storing water, prehistoric art, etc. Roberto Sáez is the author of Nutcrackerman.com, a blog about his passion: paleoanthropology, prehistoric art and human fossils. He is Teacher training certificate in human origins and evolution by the Spain’s National University of Distance Education, Teacher assistant for the course “Introduction to Human Evolution” by Wellesley College on EDX, Lecturer on human evolution, and Collaborator in the Paleontology journal ‘Nautilus’. You can also find him on Twitter @robertosaezm and Facebook. August 12, 2015 in science. My Top 5 Favorite Paleoanthropology Twitter Accounts!